Yet another great loop of moderate length. 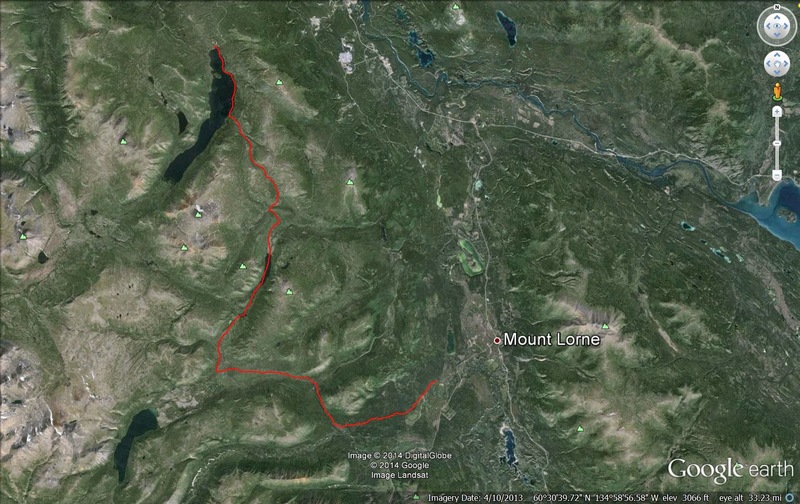 Dylan was up for an exploratory ride this Saturday, and I had "heard" this loop was in. It was. It was cloudy and snow squalls obscured the hills and mountains, but clearing was promised. We parked at the Watson river trail head and made our way into the alpine towards Alligator lake. Turned up Friday creek on good dog sled trail, following it up the valley and on to Coal lake. We both fell victim to a big chunk of ice which toppled us. I had enough time to wonder how Dylan was handling the crash when his Nate made contact with my head. Not as bad as his pedal in my shoulder. It must have looked great from afar. Pedaling down Coal lake was fantastic. Sheep watched us from the hills. Once you leave the lake, you follow a great trail through the woods until you pick up the trail the dog sledders use from Fish lake. Follow it to a high pass where you cross the Coal lake road, the follow a super fun valley down out of the alpine to Fish lake. Follow the lake back to the parking lot. Really great 50 Km ride. Topping out on the Coal lake road, just about to begin the long descent. Yee-Haw!